Tahiti 80’s adventure started in the 90s, between Rouen and Paris, when a souvenir T-shirt slogan becomes the name of a band that cuts its teeth with a few EP’s and then comes together in 1999 with Puzzle, followed by Wallpaper for the soul in 2002. Surfer-like, riding the vagaries of musical taste and finding success in unexpected areas like Japan (twice gold record), they produce music light years away from the filtered house sound on the French Touch scene. 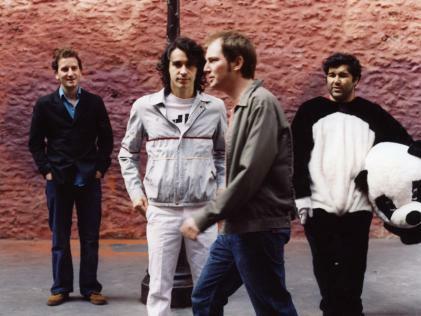 Tahiti 80 produced a soulful pop both on record and in a polished stage performance at European venues. They indeed toured in the UK, supporting Cinerama for a series of 10 dates throughout the UK, supported St Etienne, Junior Senior and The Athletes in London, and played several times at the Barfly. Puzzle and Wallpaper for the Soul have been released In Italy (Virgin/Extralabels), Spain (K Industria), UK (3MV Pinnacle), Japan (JVC), USA (Minty Fresh), Germany (EMI), Australia (Shock) and Wallpaper, and Korea (Ales Music) and around 250.000 copies of Wallpaper have been sold around the world so far. The band got synchro on TV shows like Insider, Big Brother 2003,204 and 2005 in Australia, TV Series like Smallville, Point Pleasant; advertising like Rip curl, TV film like Gilmore girls, and movies like American party, Stuck on you, Sue lost in Manhattan. First single video Changes has been directed by Jonas Odell, who got an Emmie for his Franz Ferdinand Video Take me out and he is also known for his work on Music for Madonna and excellent video for Goldfrapp. In the end, we can say we fully carried out the ideas we had for this album. We kept an enormous amount of first takes. As a result, it’s much rawer, more festive, you can dance on every track, more pop and groove, more rhythm and melody. This album is really about what we are into. A dream for any member of the band looking in.